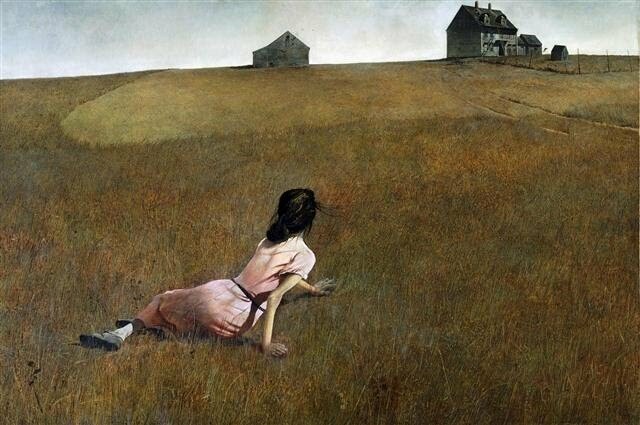 The following investigation of Andrew Wyeth's famous painting "Christina's World" demonstrates two ways in which artists and critics can use Crescendo Analysis. The first will be to show how Wyeth himself used Crescendo Analysis to create the image. The second will be to show how a viewer might use Crescendo Analysis to study the image. 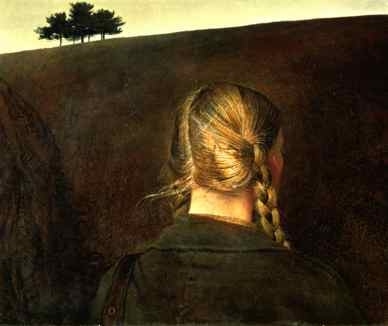 Wyeth's Use of Crescendo Analysis in "Christina's World"
The crescendo occurs from the subject's (Christina's) point of view. As the subject, she represents the "specific" or the "detail." The crescendo occurs from her gaze out over the field to the farm and beyond. That crescendo creates a relationship between the subject and the setting (or context), and there's tension in that relationship. First, we don't know what exactly she's doing on the ground. We cannot see her face. She looks as though she may be crawling. We might be anxious to insert fear or apprehension into her outward gaze. We might be just as likely to insert pleasure. Is she admiring the farm? Is she in distress? Those questions that exist between the small and the large create that tension. There is a "story" there, a narrative, and perhaps a causal relationship. Upon investigation we find out that Wyeth based this painting on his neighbor, Christina Olson, who suffered from polio. Her legs were paralyzed. For many, this knowledge may ruin the mystery or the individual's interpretation of the relationship between subject and setting. 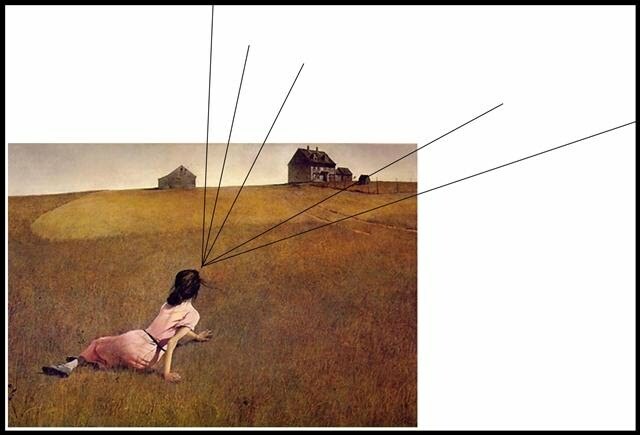 However, it also helps clarify the tension of the crescendo analysis: Christina is trapped, unable to travel outward in the direction of her gaze. The causal relationship turns out to be an impossibility or difficulty between the subject and the setting. 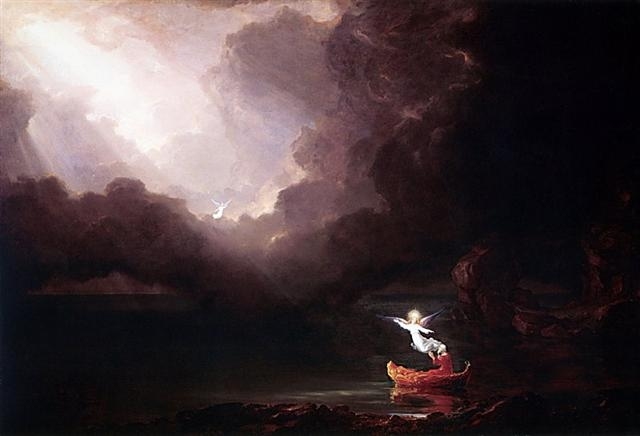 We can see this same type of Crescendo Analysis appear in countless other artists (although with different narratives and causal relationships), perhaps none better than in Thomas Cole's The Voyage of Life series (1840), in which he created a series of four paintings: Childhood, Youth, Manhood, and Old Age. 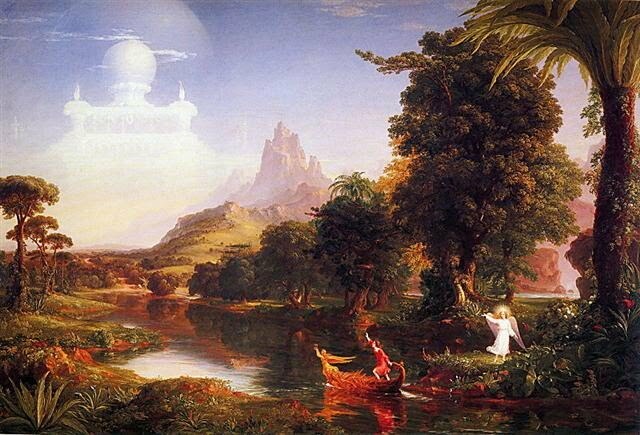 We can also see the popularity of a similar Crescendo Analysis in Asher Durand's "Kindred Spirits" (1849). 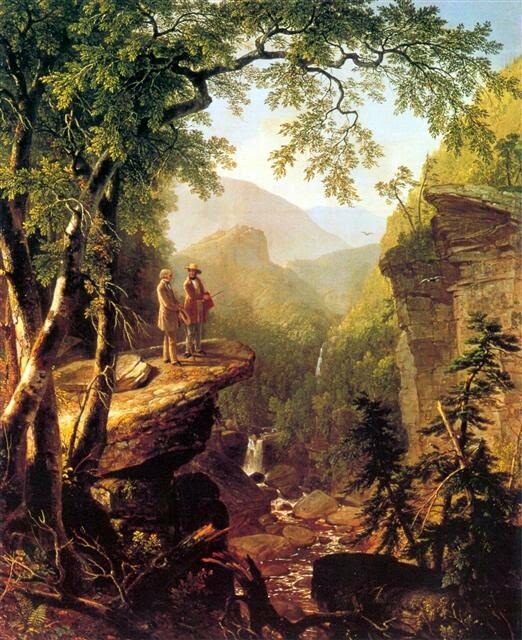 Both Durand and Cole were part of the Hudson River School painting movement, in which that relationship between the small and large to create narrative, tension, and beauty was important. Look closely at the cane of the second subject, which visually directs our eye along that crescendoing perspective. Even the tree's canopy helps to direct our attention into the vastness of the larger landscape. 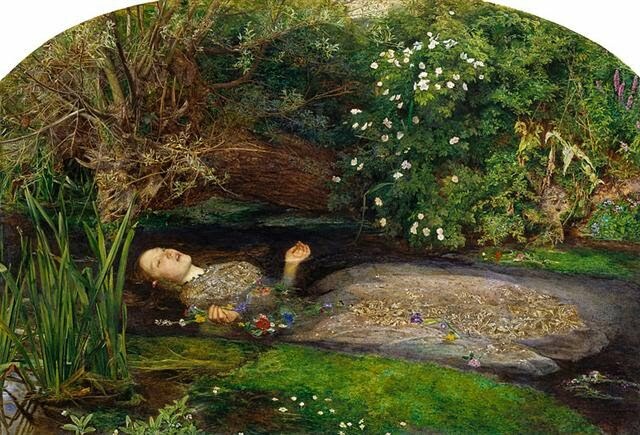 In opposition, let's look at a painting that has absolutely no sense of Crescendo Analysis: John Everett Millais' "Ophelia." The entire painting is specific, from the foliage to her fingers to her face. Her gaze is outward, but we have no idea toward what. She's also dead, and Millais has created a kind of "wake" in this painting. Like a wake, the deceased is presented in isolation--boxed. His or her relationship to the world has been erased. In fact, the tension in this painting comes from its lack of a crescendo. We may even feel just the slightest tinge of guilt as we look at this, as though we have gotten too close and have been caught admiring the beauty of the dead. Perhaps we stumbled upon her, parting the thick boughs of a willow tree to peer into this horrifically beautiful scene. "Christina's World" presents an image of crescendo analysis with which we have become very familiar. Photographers and filmmakers have used almost identical compositions to create similar narratives and tensions between their characters and settings. The Coen Brothers, in their 2007 film No Country for Old Men create an image very derivative of Wyeth's famous painting in which this character's conflict (Llewelyn Moss played by Josh Brolin) with the vast forces of nature that he once felt so comfortable in and so easily able to control (as a hunter) are later thrown into chaos when he meets a force of nature he cannot control (the ruthless killer Anton Chigurh, played by Javier Bardem). 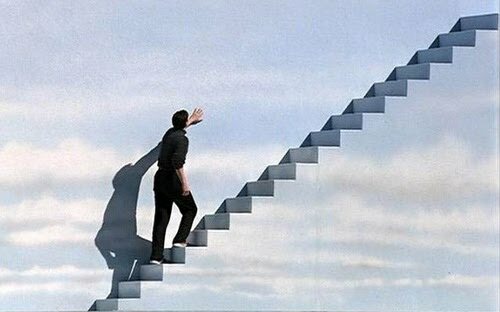 In the Truman Show (1998) subject and setting are at the very center of the narrative. 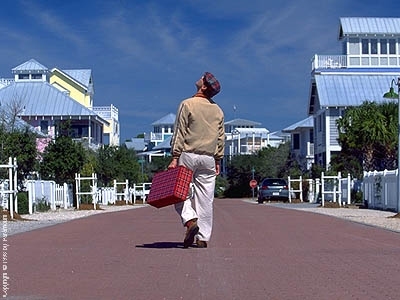 Here, Truman (played by Jim Carrey) inspects his world--a world the viewer knows is fake--simply a stage set. Here, Truman touches that sky he always thought was infinite. The tension in this image and in this film comes from that mistaken perspective between the small and the large. Truman believes there's a big world out there, but in fact that crescendo is only an illusion. Like in "Christina's World," the tension comes from Truman's difficulty escaping his isolation. 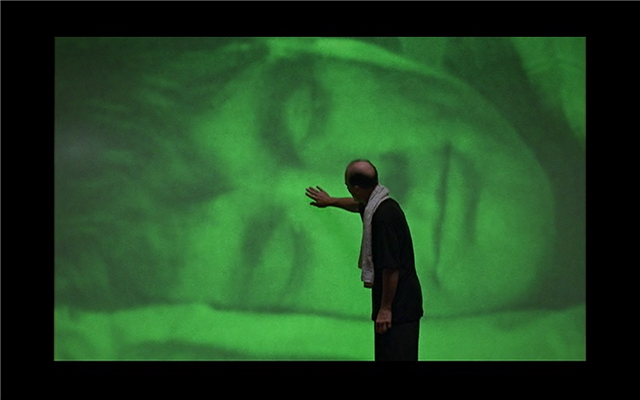 And perhaps my favorite example of that collision between the small and large comes in this scene, where the creator, Christof (Edward Harris) admires his prisoner, Truman, whose face is blown up as though to suggest that he is actually the biggest among them. This crescendoing acts in two ways. The viewer can now sympathize more with Truman--just look at him, a sweet, sleeping prisoner. But it also suggests that we're all like Truman in a way--that he is blown up on that screen to indicate that he represents all of us, trapped by whatever it is that might trap us--our marriages, our religion, our jobs, our regrets, our mistakes, our daily grind. The tension between the large and the small comes from Truman's ignorance and Christof's power to control and contain him. It is the story of one man fighting the entire world in which he lives. A Crescendo Analysis of Wyeth's "Christina's World"
We've now analyzed Wyeth's and others' use of crescendo analysis as an artistic technique of creating narrative and tension between the small and the large. 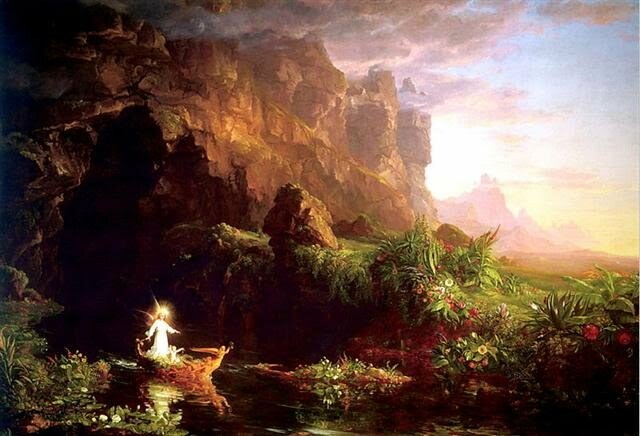 Now, we're going to apply critical crescendo analysis to Wyeth's painting, creating an argument about the painting by starting with a specific detail and broadening out. If I were to suggest that Christina, the subject of Wyeth's "Christina's World" represented a male, sexual idealization, you might roll your eyes. You might say, "Only Freud would agree." 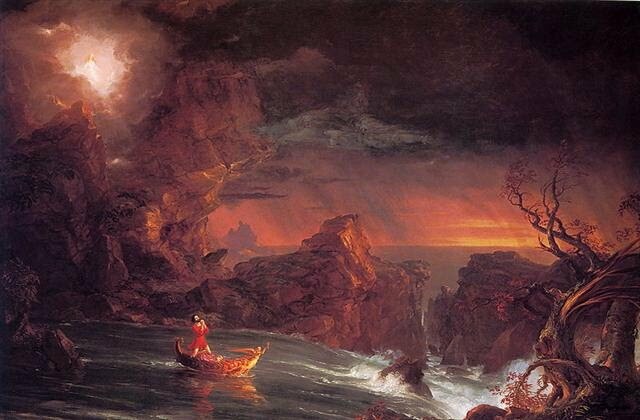 But for a moment, take a look at this Crescendo Analysis of the painting. The color pink is often associated with the female. The hand clutches at the earth. She sinks her fingers into the grass. This could be sign of pain or pleasure. It indicates some kind of physical extreme and stimulation. The posture is suggestive of lying down. Her right hand lies significantly behind her right shoulder, as though she is about to raise up on her knees or collapse down on the grass. Her back is to the viewer, allowing the viewer to gaze at her without her knowing. It puts the viewer in position of dominance. The viewer is slightly above her, looking down. 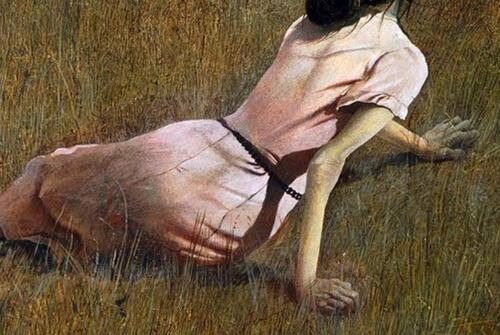 While Andrew Wyeth based this painting on his neighbor, who had polio and was paralyzed from the waist down, he used his wife as a model, especially for the subject's torso. The pleasing curves up from the hips, the thin waist, the posture, the pink dress, and the subject's faceless anonymity all suggest both a tenderness and a dominance that Wyeth exerts over this subject. 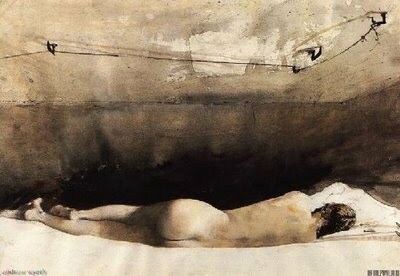 In Andrew Wyeth's "Helga Pictures" he paints Helga in similar postures. Wyeth admitted that he was "smitten" with Helga, and that he had to "become enamored" with a model to successfully paint her. Notice the similarity between the landscape in "Christina's World" and the landscape in this Helga portrait. Her back faces the viewer. It's almost as though the viewer has become Wyeth, who can gaze at Helga who he is "enamored" with without her catching him, just as we can gaze at and consider Christina. We can see this sexuality in the countless parodies that artists have created of this painting, exaggerating the sexuality of the subject. Crescendo analysis, much like inductive reasoning, allows us to create a narrative--one which becomes an argument.